Eastbound SR 16 and southbound I-5 exit to eastbound S. 38th Street is closed until 8 a.m. April 21 for construction. During the closure, drivers will detour using southbound I-5 to South 56th Street to northbound I-5 and exit 132. Once the ramp reopens, all SR 16 and I-5 travelers will have access to both directions of South 38th Street. The South Sprague Avenue on-ramp to southbound I-5 is closed for construction through June 2019. Drivers will follow a detour to westbound SR 16, to Union Avenue, to eastbound SR 16 where they will merge left onto newly-opened HOV lanes to southbound I-5. 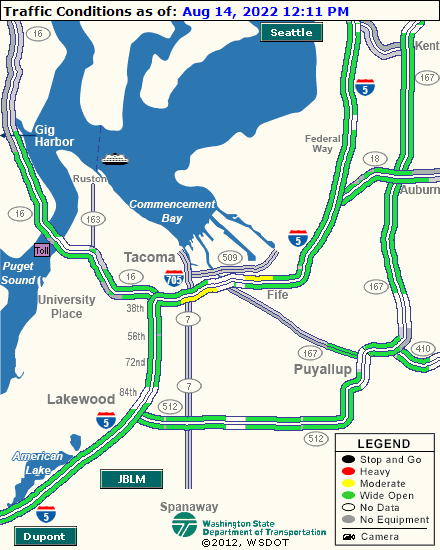 TRAFFIC REVISION through June: Eastbound SR 16 drivers heading to southbound I-5 will merge left to reach southbound I-5. Eastbound SR 16 drivers will not have access to South 38th Street until weekend of April 20-21. Southbound I-5 exit 132B to westbound SR 16 will close from 10 p.m. Saturday, April 20 to 8 a.m. Sunday, April 21 for construction. Drivers will detour on southbound I-5 to S. 56th Street to northbound I-5 to exit 132. The southbound I-5 exit 132A to westbound South 38th Street will also close during this time. Drivers will follow the same detour. Northbound I-5 near 41st Division Drive will be reduced to a single lane for paving from 12:30 a.m. to 5:30 a.m. Saturday, April 20, and from 12:30 a.m. to 7:30 a.m. Sunday, April 21. The 41st Division Drive on- and off-ramps will also close during this time.